Filed to: A Whale of a Fail!Filed to: A Whale of a Fail! A Whale of a Fail! The small fishing village of Astoria, Oregon, tried to scare off a pesky sea lion colony with a large fake mechanical orca. It was a cunning scheme, one that pitted the sly artifice of man against whatever it is sea lions have. But alas—nature won. 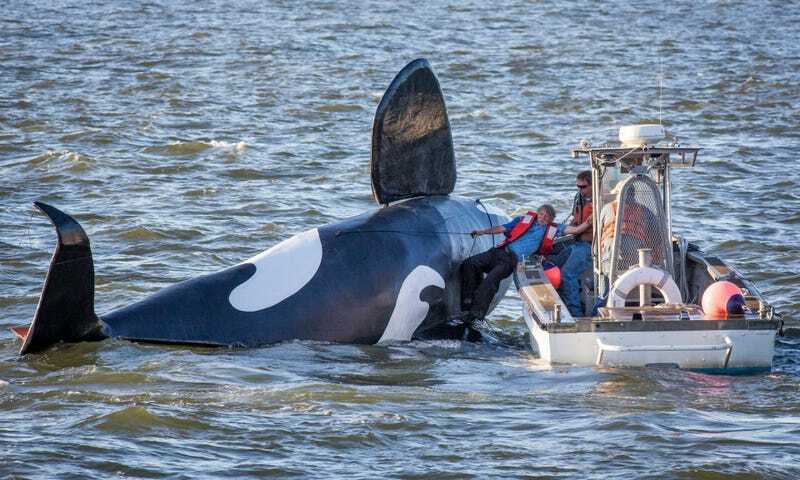 The plan to unleash the fiberglass orca—which is actually a licensed boat—was concocted to spook the sea lions using recorded whale noises and the visual threat of imminent death by top ocean-dwelling predator. But the 32-foot-long fake whale’s maiden voyage didn’t exactly go... swimmingly. First, problems with the engine marooned the fraudulent beast. Then the fake orca proved itself almost infinitely inferior to its real-world counterpart by quickly starting to sink. Port of Astoria executive director Jim Knight told The Guardian that the sea lions got “deathly silent” when the doomed orca came into view. Which sounds good, except then the fake orca filled with water and tipped over. The bold dreamers of Astoria plans to try this bold gambit again in August.